Last week my husband and I took our teenage foreign exchange student on a week long vacation to Washington DC. She loves history and had the week off of school for Fall Break, plus that city has been on our list of destinations to visit. We’re always looking for an excuse to travel! Before we left, I began thinking about how we could make sure that all 3 of us had the best experience. My husband and I love to wander and explore off the beaten path. But we weren’t sure if our teen would be up for that. We eat whenever we get hungry, don’t always have a formal plan for the day, and aren’t huge fans of shopping. But we knew that those things would probably need to shift to accommodate our family of 3. If you have teenagers in your family, then you understand what I mean! I planned some activities in advance and a few things happened on the fly. I’ve reflected over our choices since we returned a few days ago and gathered together a list of tips for traveling with teenagers. Find yourself traveling with a teen or tween? Here’s my best advice on how to keep them entertained, happy and energized. Tip #1: Pick your one thing. Before we began planning this trip, I made the decision that each person in the family gets the opportunity to pick one must-do activity, place to visit, or food to eat. That will be a priority. If we each get to do our our one thing, then we will feel like our vacation was a success (or at least there was one good thing about the week). And here’s the catch: no one else gets to complain about someone else’s must-do activity. If our exchange student chose to go to a museum that we care nothing about, we would still attend with her, no complaints, no heavy sighs, no whining. Naturally we would set a reasonable time limit, because 2 hours should be plenty of time to explore the museum. As parents, it truly was a joy to see her explore the museum of her choice! And she patiently walked around Arlington Cemetery, knowing it was my husband’s must-do activity (although she honestly cared less about visiting dead people’s grave sites). Likewise my husband made the best of our time visiting Mount Vernon since it was my top pick…he even admitted that he was glad we went because it was a great refresher course on US history! Tip #2: Find wifi and make time for social media. Technology and social media are priorities for most teenagers. However, walking around while on your cell phone is stupid unwise. I’ve seen plenty of people smack directly into each other because they were both on their cell phones and not looking ahead. I’ve also seen a girl trip off the edge of a sidewalk curb because she was texting. And lastly, I’ve watched people miss their bus/metro stop because they were distracted on social media. Those are true stories, and I’ve seen them occur more than once! Before we went to Washington DC, I noticed this tendency in teenagers to be on his/her phone while walking (even our exchange student). So my husband and I brainstormed ways to combat this habit. The first problem we encountered was that our exchange student loves to take photos on her phone! We didn’t want this “no-phone rule” to hinder her creativity and interpretation of the world around her. So we decided that the phone needed to stay. If the phone stays, how can she use it wisely, such as only for taking photos? We came to this conclusion: you may use your phone to take pictures while sightseeing, but you may not use it for social media/texting while walking around. (It’s common for adolescents to take a photo and instantly upload it to social media – which also drains your data). We compromised by allowing her to spend a few minutes on her phone every time we took a break or at a meal. Yes, normally we don’t allow the cell phone at the dinner table. But we were willing to make this compromise so she didn’t miss the world around her while touring. We’re not mean enough to completely ask her to commit social media suicide by being absent for a week straight. We just asked her to limit her online presence to only meal times and evenings. In hindsight, I’m so glad we had this conversation! We were able to declare expectations and set healthy boundaries. Plus, as parents, we were held accountable to schedule time to take a break or be online. After all, we have email to keep on top of as well! Tip #3: Make food an experience. Everyone must eat. But eating out for 3 meals a day for 7 days a week can get tiring. Rather than eat plain takeout from common restaurants, we made food an experience. A few days before the trip we talked about this local Italian restaurant that is run by Italian immigrants. We made reservations for our first night in town; this was a treat to look forward to! Another evening we got take-out food from a highly recommended Mediterranean restaurant, sat by the Jefferson memorial and watched the sunset. Then we strolled along the lake back to our hotel. Both me and my exchange student think this is one of the most memorable times of our vacation! Another way to make food an experience is to enjoy treats. Ice cream is the dessert of choice in our home, so we made a point to get ice cream often. A “just because” treat can perk up anyone’s mood! Food can fuel your body for a long day, refresh you after an exhausting walk around town, and be the highlight of an evening to come. Plus, teenagers are always hungry, so good food is a win for most adolescents. 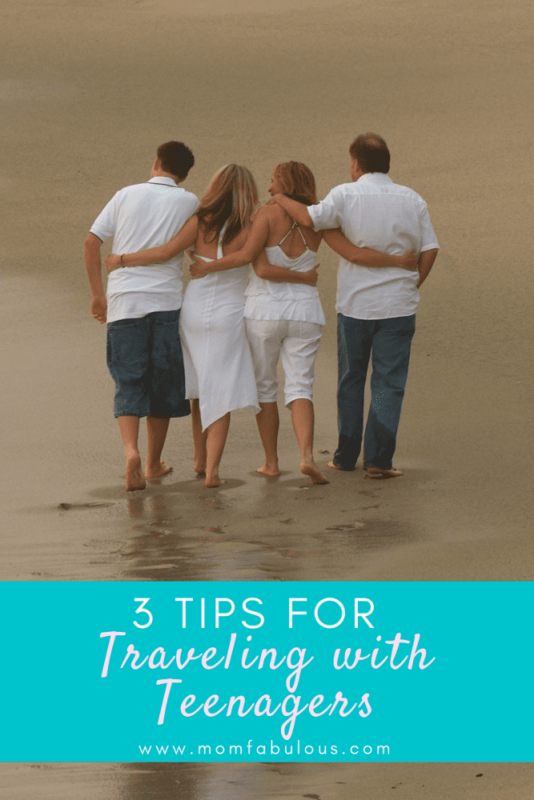 Overall, following these 3 tips made vacation with a teen or tween much easier than expected. What are you favorite tips for traveling with teens? Have you tried out a piece of my advice? How did it work for you. Share in the comments below!